The Easter celebrations in Poland really begin with Palm Sunday, when most Poles will take a “palm,” like the one on the right, to church to be blessed. These palms are usually made from cut, dried flowers, and are very pretty. You can buy some mass-produced ones now in the larger stores, but the best are made by little old ladies, who then claim a corner of a sidewalk downtown, or in front of a store, and sell them in the week before Palm Sunday. For the amount of work they put into them, they are amazingly inexpensive. The palms are a Catholic custom, and I don’t know any evangelical churches that incorporate the custom into Palm Sunday worship. I would love to, but our Baptist Church has an allergic reaction to anything that looks Catholic! Monday through Wednesday, there are regular masses in Catholic Churches – which of course is true of every day of the year – but more people do attend these daily masses than at other times of the year. Maundy Thursday is especially important for Catholic priests – and we have a LOT in Lublin. There is a special Mass (Mass of the Chrism) just for priests in the Cathedral, where priests renew their vows and celebrate the Eucharist. Holy oils are also blessed during this Mass. Later, in all Catholic churches, there is a Mass that includes the symbol of foot-washing. Some very committed Catholics will fast from Thursday evening until Easter breakfast. On Good Friday, people will begin preparing for Easter breakfast, especially painting Easter eggs. Old Polish pagan beliefs said that eggs chased away bad luck. 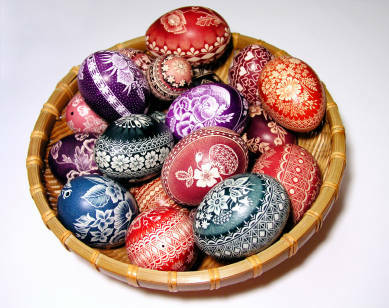 I would be curious to know if this is the root of the custom of painting Easter eggs in other countries as well. Many people, especially those with kids still home, will paint their own. Although just like the palms you can buy some mass-produced ones, the best ones are sold by the same little old ladies, who seem to have not moved from their sidewalk. The faithful will prepare a grave for Christ at church, and many will take part in the Stations of the Cross processions. Each area of the city will have its own procession, with the most important one beginning at the Cathedral, and making its way through the Old Town. This procession is an “ecumenical” procession, involving representatives of other churches, including Orthodox, Lutheran, Baptist, and sometimes Pentecostal. It is based on the “Scriptural” Way of the Cross. After the Way of the Cross, a figure of Jesus will be laid in the grave, to await Easter Resurrection. Some men will be chosen to guard the grave through Saturday, and during the day Saturday, many people will come visit the grave. When they visit, they will also bring Easter baskets to church to be blessed. These baskets are highly symbolic, with each element having some meaning connected to the death and Resurrection of Christ. However, basically, they are a wicker basket lined with a white cloth, containing some bread, kielbasa and ham, an egg, vinegar, salt and horseradish. In addition, there will be a little lamb, sometimes made of wood or plastic, but best if it’s made of bread or sugar. These baskets are blessed by a priest, and everything is ready for the Easter breakfast. Easter Sunday begins with the Resurrection Mass at 6:00 am – another one of those great ideas that hasn’t caught on at our Baptist Church :). Easter then is a family day, and after Mass, begins with everyone sharing with one other some of the blessed eggs. Easter breakfast includes a malt soup – sometimes in a bread bowl, hard-boiled eggs, white kielbasa, cold cuts, horseradish, and a special cake called a Babka. (which is slang for little old lady – go figure). Easter Monday has its own special tradition – old, pagan, and one of the greatest traditions in the world – but that’s for the next post. Thanks for the overwview of Easter in Poland. Well done!